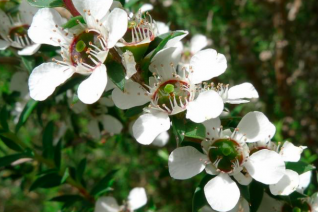 Manuka. 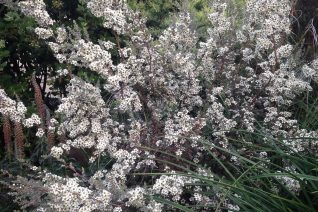 This is a wonderful very upright wispy evergreen shrub with tiny leaves that turn maroon in winter and masses of white flowers in early summer. Flowers are born on wood from the previous season and are much larger than the foliage. The effect in early summer is a shrub clad in snow. To 8′ tall x 4′ wide in 5 years. Full sun and a protected position, such as against a south facing wall. This form is from the Washington Park Arboretum in Seattle where it has thrived for many years. A selection made from high elevation inland New Zealand. Grows very fast w/ light summer water. Excellent fine textured plant. Moderate deer resistance. Cold hardy to a little below 10ºF- it has been damaged but recovered from lower temperatures. Very easy to grow wild looking plant. Drought adapted when established. 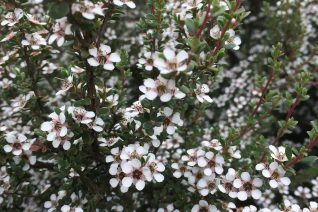 Rare shrub that is destined to gain popularity. From the highest elevations of the Australian Alps this large evergreen tea tree is beautiful in all of its parts. 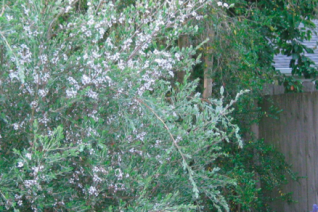 Known locally as alpine downy tea tree the fuzzy silver small leaves crowd the stems densely. In early summer masses of 1″ white flowers deck the boughs like snow. To 8′ x 8′ quickly it can also be trained as a small tree which highlights its incredible exfoliating trunks. Silver, copper, green and tan are all present after the bark sheds in mid-summer. Full sun and virtually any soil. Totally summer drought tolerant when established. Great hedging candidate. If sheared it becomes immensely dense. And cutting does not mangle the tiny leaves. Moderate deer resistance. So far undamaged at 5ºF. 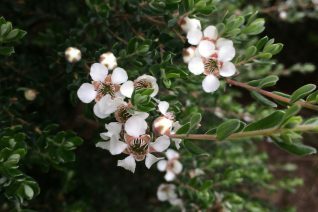 Wooly tea tree is a cold hardy member of the myrtle family from down under. The pewter gray small evergreen foliage creates a cloud like outline. In June 1″ pure white single flowers spangle the boughs like snow. Woody seed capsules follow and persist. To 12′ tall and 4′ wide in 7 years. May be limbed into a small tree. Full sun and virtually any soil. Light summer water though very drought adapted. Excellent background shrub or screen or large informal hedge. Takes well to pruning which will not mangle the tiny foliage and becomes very dense as a result. Good bet where deer are a problem. Cold hardy to about 5ºF. Grows very fast wit regular irrigation which is recommended for the first summer to establish. Does not tolerate shade of any kind. When using as a hedge plant about 2′ apart for a fast screen. Prune after flowering and again in autumn. Tasmania. 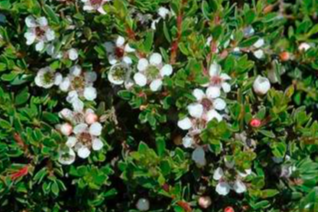 One of the naturally cold hardiest species of tea tree. This form of Alpine tea tree from Tasmania has a distinctly upright habit. Cinnamon red squiggly stems support tiny pewter colored evergreen foliage. In early summer pink buds spangle the stems opening to pure white single flowers. So prolific is the bloom that the plant appears covered in snow. Vigorous growth to 5′ tall and 3′ wide in 6 years. Full sun and virtually any soil. Summer water is tolerated but far from necessary. Takes pruning incredibly well, including shearing and the leaves are so small that they remain unmangled. Pruning immediately leads to a denser plant. Makes a great cold hardy, dense, small, and deer resistant hedge. Leaves are aromatic when bruised. You achieve a much shapelier plant with even a minimal amount of tip pruning. otherwise it has a very wild habit. Cold hardy to 0ºF. Drought adapted. Tasmania.